PART 1: We have new DECKS ($lave, Girl, Anti Hero, Real and Bacon) ….. HELMETS (S-One and Protec) ….. Thunder TRUCKS ….. and WHEELS (Blank Cruisers, Old School Kryptonic Slammers and Old School OJ Street Razors). 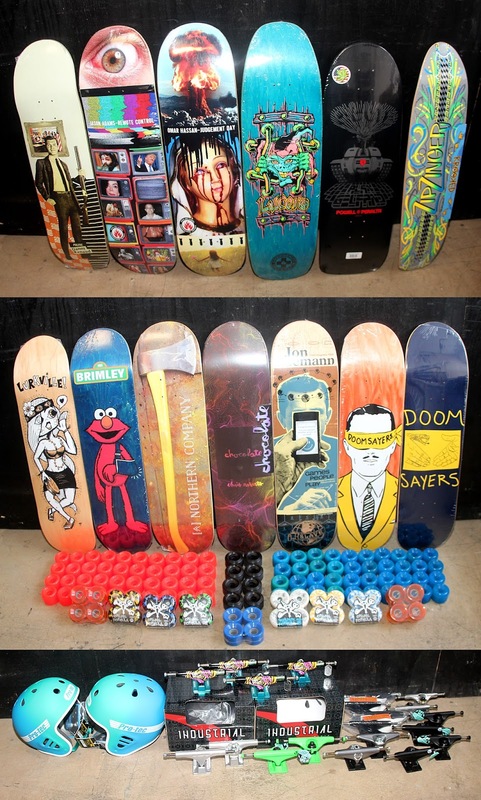 PART 2: We also have more new DECKS (Politic, Black Label, Powell & Peralta re-issue, Krooked, Lurkville, Brimley, Northern Company, Chocolate, $lave and Doom Sayers) ….. WHEELS (Bones, blank cruisers, old school Kryptonic Slammers and old school Schmitt Stix) ….. TRUCKS (Thunder, Venture, Ace, Industrial and Mini Logo) ….. HELMETS (protect and Industrial) ….. and more smalls not pictured.